Detroit’s downtown and riverfront is home to many pieces of artwork, and one of the most prominent is the Monument to Joe Louis, a 24-foot long arm suspended by a 24-foot tall pyramid frame. 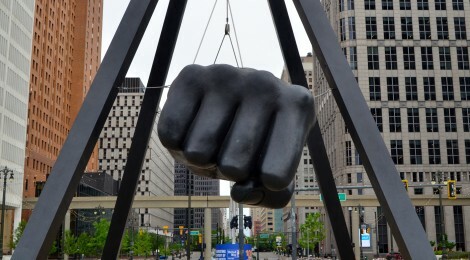 The Joe Louis Fist was dedicated on October 16, 1986 and gifted to Detroit by Sports Illustrated magazine to commemorate the Detroit Institute of the Arts’ 100th birthday. Sculpted by Robert Graham and poured by bronze artist Rolf Kriken, the fist pays tribute to the power Louis had in the ring as well as his efforts to fight racism outside of the ring. Louis is considered one of the best boxers of all time. 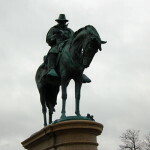 He won 66 of his 69 fights and his win over German Max Schmeling in 1938 was used as a rallying point of American pride as World War II loomed. 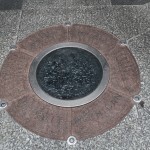 He held the title of heavyweight world champion for 12 years. 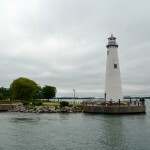 Born in Alabama and raised there until the age of 12, Louis moved to Detroit in 1926. 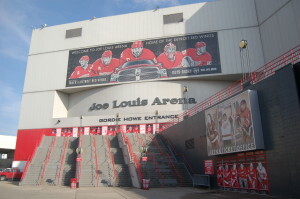 In addition to the fist sculpture, there is a statue of Louis inside Cobo Hall and Joe Louis Arena (where the Detroit Red Wings played from 1979 to 2017) was named for him. 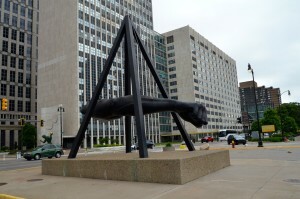 The Monument to Joe Louis is located at the intersection of Jefferson Ave. and Woodward Ave. across from Hart Plaza. 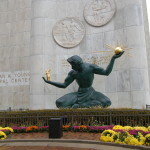 The Spirit of Detroit sculpture is located across the street in front of the Coleman A. Young Municipal Center.